In the last days, i worked on a project of PC maintenance and one of the requirements of this application was basically to display the name of the antivirus installed on the PC if there's any. At first sight i though, this will be difficult. Fortunately, it isn't so difficult as it seems because windows already works on this feature, so you will need to access its APIs to retrieve the information (we are talking about the SecurityCenter). Windows Security Center is a reporting tool that is built into the operating system, since the release of service pack 2 for Windows XP, that monitors the health state of the endpoint in different areas, such as Windows updates, firewall settings and antivirus/anti-spyware settings. In this article, we'll show you how to retrieve the current installed antivirus name accesing the AntiVirusProduct class of the security center. Select the Assemblies (framework) Tab and Search for System.Management and finally add the reference and click OK.
We need to add the System.Management to create queries in WMI Classes. 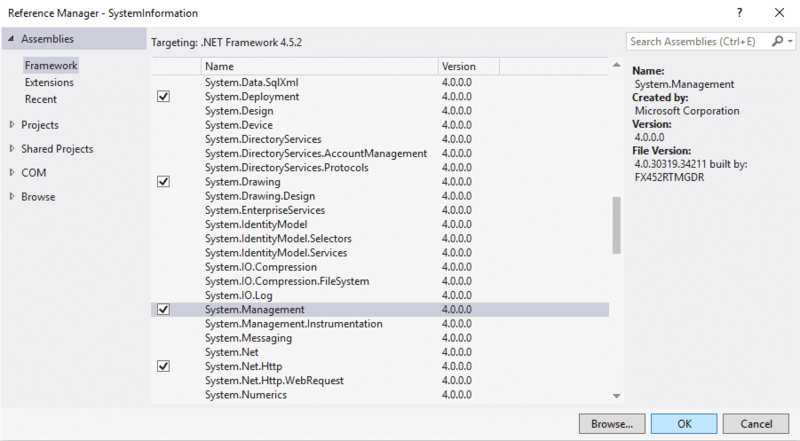 Read more about retrieving WMI Classes in .NET in msdn here.